The New RectangularsA General Outline. (a) A General Outline of Issues and Re-Issues. the Unissed ¼-Anna Plate. (b) Plates, Plate-states and Relative Printing Positions. (c) Papers, Watermarks and the So-called “Controls”. (d) The Perforating Machines. (e) Notes on Colours and the re-issues. The introduction of new plates and of new methods, in and after May 1878, brought about so many fresh points of philatelic interest, that a preliminary survey is needed in order that these may be properly appreciated. (1) The Plates and Plate-States. (2) The relative plate-positions duing simultaneous printing. (4) Perforation and the perforating machines. 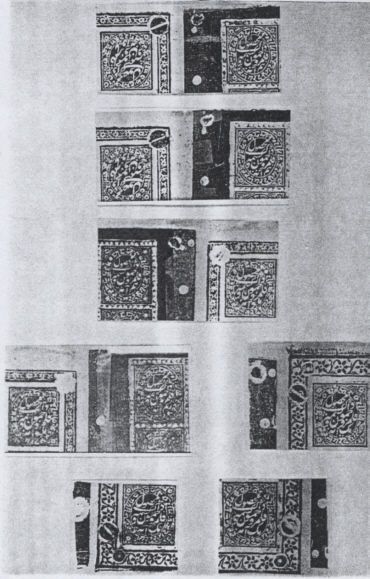 (5) An outline of the issued stamps. (6) An outline of the Re-issues. Masson paid but little attention to these issues, probably owing to his increasing interest in the philatelic problems of Afghanistan. Evans, when writing a critical review of Masson’s work, some three years after its publication, included a chapter on the New Rectangulars, and this, though admirable in determining many points which Masson had left untouched, still requires much extension and revision. Before dealing in detail with the above groups, a few preliminary remarks may be made about each. With one exception, each of the New Rectangular Plates underwent one or more marginal alterations which occasionally extended to and affected some of the stamps themselves. These alterations have scarcely been noticed by previous writers, but they, nevertheless, frequently possess features of exceptional philatelic importance. No such alterations ever occurred with the plates of the Old Rectangulars. At a period when stamps of all denominations were issued in one standard coloureither in red or orange for the public services, or in black for official useit became the practice to print, in one or other of these colours, from more than one plate at a single operation. The philatelic importance of these relative positions has not, previously, been referred to. Evans made a wholly admirable classification of the New Rectangular papers, but the watermarks and Controls have not, hitherto, been noticed. Evans’ analysis proves, as he himself suggested might be the case, to be over-elaborated for practical purposes. The watermarks found on certain papers possess a high degree of philatelic importance and there can be little doubt but that, were material available, further study would lead to the clearing up of several problems which still await solution. Three types of Controls are included in our notes. These took the form of small devices embossed by the manufacturers on the paper in plain relief. We employ the term “Controls” for want of a better, but the expression merely denotes the checks exercised by the manufacturer on his paper, and these were sold in the open market for many other purposes than that of stamp-production. The “Controls” had no connection with any check on the stamps themselves and appear to be of only slight philatelic importance. This is, again, a philatelic feature new to the native stamps, and much that Masson and Evans wrote has been emended and added to. It need only be added here that two perforating machines (which we shall refer to as the “A” and “B” machines respectively) were provided, and that these broke down so quickly that only few points of importance arise from the perforations found on the stamps. (1) A four-year period (1878-82) during which all denominations, printed for the public services, were in standard shades of red or orange with the exception of some early and, probably, more or less experimental colours. (3) The entire period of fifteen years, during which printings were made from the plates in black for the exclusive use of the Official Service. For all of these the old oil and watercolour pigments were discarded in favour of ordinary printers’ ink, with two rare exceptions. 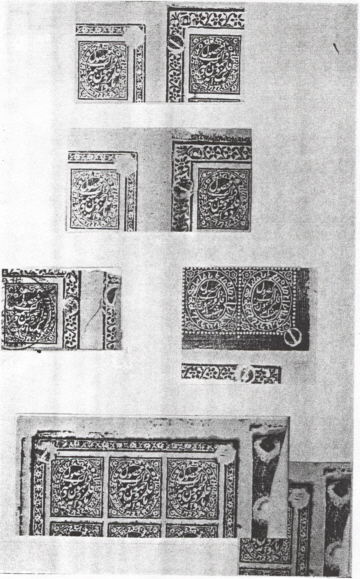 For the New Rectangulars, seven plates in all were engravedone of ⅛-Anna denomination, two of ¼-Anna, one each of ½-Anna, 1-Anna and 2-Annas (all of these being single-denomination plates) and one Composite plate containing the 4-Annas and 8-Annas. All Plates were separately hand-engraved as previously, and give a combined total of 113 distinct types of stamps. Of these the ⅛-Anna was not issued until some five years after the other denominations; and from onethe second ¼-Anna plateno stamps were ever put into use. 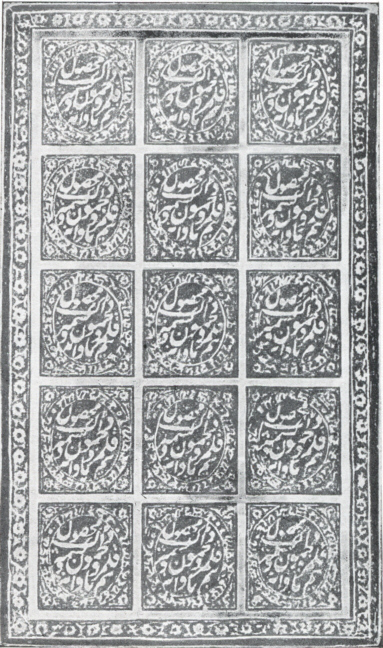 The engraver of the Old Rectangulars, Rahat Ju, was again employed except for the second (unissued) plate of the ¼-Anna and the high-value Composite plate, these two having been entrusted, for some reason unknown, to a different engraver whose name has never been disclosed. Two plates (one by each engraver) shew lines of imitated perforation between the subjects, the plates being the ½-Anna and the Composite plate. These imitated perforation lines were also commenced on the unissued ¼-Anna plate, but were not proceeded with. 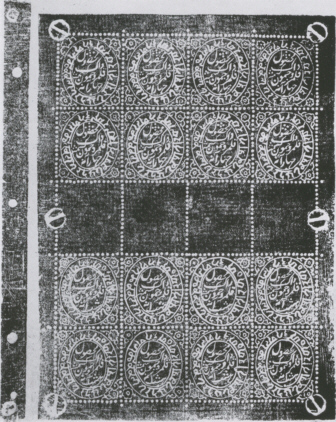 As the ½-Anna was the first to have been engraved, and as perforation was about to be attempted for the first time, it may be that these imitated perforations were intended as a guide for the use of the perforating machines. ...machines instead of (as ordinarily) making the perforators fit the plates. The “A” machine was capable of perforating 15-subject plates with five horizontal rows, each of three subjects, while the “B” machine could perforate 20-type sheets containing five rows of four. 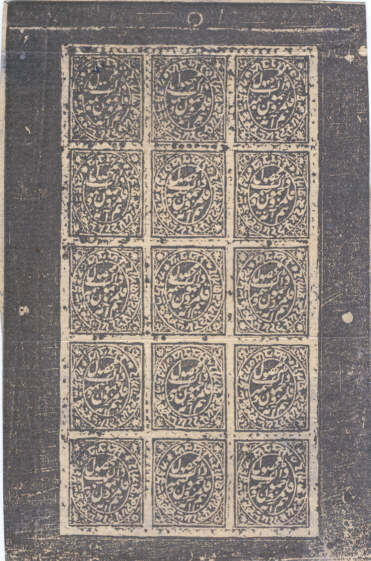 The Composite plate, however, contained 16 subjects onlyeight each of 4-Annas and 8-Annas, and this was brought up to 20-type size by dividing each group of eight by a central horizontal row of four blank spaces and, thereby, rendered suitable for perforation by the “B” machine. The unissued ¼-Anna plate was of 12 subjects only, but long before this plate was engraved, perforation had definitely been abandoned. ¼-Anna (issued) Single 15-type I., II. ½-Anna Single 15-type I., II., III. 1-Anna Single 20-type I., II. 2-Annas Single 20-type I., II. 4 + 8-Annas Composite 16-type I., II. It may be stated, broadly, that all plates were, in the first instance, affixed to their beds by small marginal rivets only, some of which gave impressions in printing. This constituted State I. At a later period the plates were disbedded and re-fixed by other rivets or screws, the heads of all of which produced impressions in the printing, such impressions constituting State II. In the case of the ½-Anna only was any subsequent change made from State II. This state lasted, in all other denominations, for some fourteen years but, in the case of the ½-Anna, for about two months only, at the end of which period, further large rivets, constituting State III., were added. We shall now discuss these states more fully, taking the plates in order of their denominations. This plate was (except for the unissued ¼-Anna) the last plate to be engraved, and is notable for being the only one which suffered no change of Plate-state throughout. The ornamental border is narrow, and composed of a flower pattern. The border shews no impression from the heads of any of the rivets used for bedding the plate, from which it may be possible to infer, either that the plate was first bedded, and the border subsequently engraved over the rivet heads, or that the rivets were placed well beyond the border itself, and thus were unreached by the printing ink. The ¼-Anna. (Issued plate). (1878late). Probably engraved rather later than any of the following except for the unissued type. The border closely resembles that of the preceding in its narrow width, leaf-and-flower pattern, and absence of rivet-impressions in State I. In State II. [above], each of the four screws, inserted at the angles of the border, cut away a corner of the stamp-impressionsTypes 1, 3, 13 and 15. Whether from the screws working loose or for some other reason, many of the later (but not the latest) printings, give the stamps the appearance of slight double-prints. 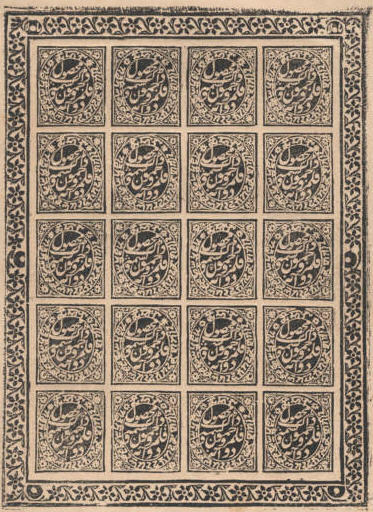 True double-prints are also known from this plate. The ¼-Anna. (Unissued plate). (1886?). The laid and wove papers are unquestionably those of issued stamps, and all such impressions should, we think, be properly classified as “Stamps prepared for use, but not issued.” Impressions on the native paper were probably Proofs, and never intended for issue. Impressions in vermilion, on the thin toned wove, are known with the Control of 1884. We have seen so-called “used” copies on all papers except native. These include a heavy obliteration composed of a few broad bars forming a rough square: This is certainly bogus, and is also found on another “prepared for issue” stampa ½-Anna blue on thin coarse wove. A second type of obliteration, also probably bogus, is known. A 15-Type Plate suited for perforation by the “A” machine. This plate was probably the first to have been prepared. It is, at least, certain that ½-Anna stamps were the first to be have been issued. The original number of rivets was about 20five (or perhaps six) at each side, three at the top, and five at the bottom, the latter including two small vertical pairs with a large central one between them. The number of rivets is far greater than were employed for any other plate, suggesting a difficulty in fixing from the outset. State I.In this, the top margin was nearly as wide as those at the sides, and was divided almost centrally by a long horizontal incised line passing immediately beneath the three rivets in the upper margin. Of these rivets, the central one only gave a clear impression in print. The plate remained in State I. for about two years (1878-80). State II. Nearly half of the upper margin, including the three rivets was cut away, the line of severance following that of the horizontal line mentioned above. Fresh rivets were driven into the border at each lower corner, and also in the right side of it, opposite types 3 and 15. At the outer corner of types 1 and 3, larger and irregular shaped holes appear in place of the small circular ones, owing to fresh rivets having been inserted close to the original positions. State II. also lasted for about two years (1880-82). State III. Nine large rivets, impressions from which became surrounded by wide uncoloured rings, increasing in size with the age of the plate, are now added(a) Five, very large, in the left margin; (b) two, very large to the right of type 3; (c) a comparatively small one opposite type 9 and (d) a very large one in the centre of the bottom margin. The plate remained in State III. for about twelve years, from late in 1882 or early 1883 until the close of the Posts in 1894. ...lines frequently became clogged with ink and failed to give an impression; and this also applies to a number of small scratches over the Cross. The occasional absence of both Cross and scratches has been the cause of attempts to prove a still earlier condition than “State I”, but there can now be no doubt but that the sole reason for no impressions appearing in a print was neglect in cleaning the border. These plates, having many features in common, may be considered together. They were the only 20-type plates, and were made up (probably slightly later than that of the ½-Anna) to a size suitable for perforation by the “B” machine. Both were surrounded with almost identical leaf-and-flower patterned borders which resemble those of the ⅛-Anna and ¼-Anna plates except for being considerably wider. 2-Anna Plate in State I. They are the only flower-patterned plates which shew the positions of the original rivets. These were six in number in each plate, two being placed near the ends of the upper and lower borders respectively, and one, centrally, in each side-border. Those in the upper margins are transverse ovals in shape, each with a central dot; at the side of each dot appear engraved native characters. The remaining four rivets are, roughly, circular; each with a central dot without engraving at its sides. The two characters engraved on the upper rivet-heads are identical in both plates. A number of different translations can be made of these, but none appear to have any philatelic importance. 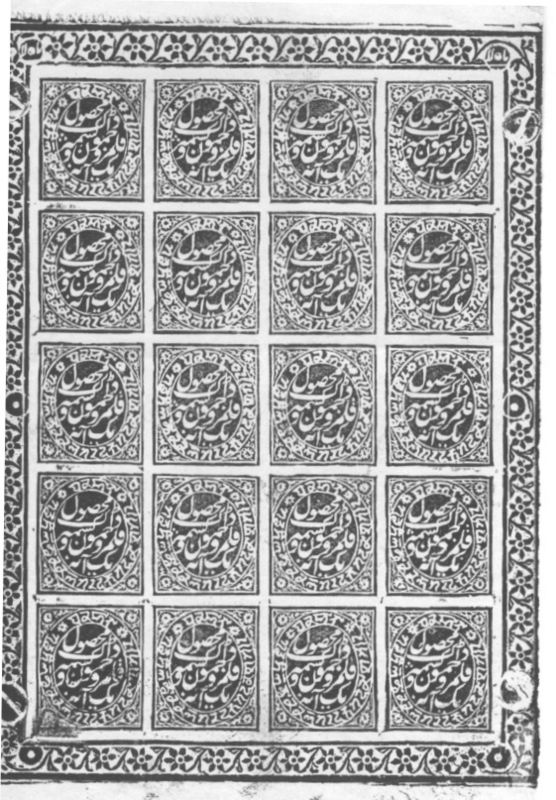 They are not, apparently, the initials of Rahat Ju, the engraver. 1-Anna Plate in State II. In both plates all six original rivets still remain, but four large screws were addedone near each end of the two side borders. None of these screws cut into the engraved subjects. ...that the directions of the slots of the screws never varied. This could not have occurred if, as Evans suggested, the plates had been unscrewed after successive printings. The two lowest screws of each plate shew clearly defined impressions during the earlier printings, but, owing to curvature of the plates at these points, later impressions of one of the other are surrounded with large white rings which often spread over a portion of the types (17 and 20) nearest the screws. Some of the later printings shew a heavy ring round the left screw, and none round the right, while in others the reverse is the case; from this it follows that the plate-curvature was periodically reduced at one or other of these points. In this connection it is important to realise that the rings are not the result of plate-wear, and do not, therefore, afford more than an occasional clue to the period of any particular printing. Nothing is known as to the reasons which prompted the authorities to entrust the preparation of this plate (together with that of the unissued ¼-Anna) to a different engraver; but the general workmanship and designs of both plates leave no doubt but that this was, in fact, done. This plate is the only one in which there was no cutting away of the spaces between the stamps. The spaces, therefore, were printed in solid colour and were relieved by rows of imitated perforation dots punched on these positions. The upper part of the plate was engraved with eight 4-Annas subjects and the lower part with eight of the 8-Annas, the two denominations being separated by a horizontal line of four blank spaces, added to bring the plate up to 20-type size suitable for perforation by the “B” machine. State I. We have never yet seen a complete impression of the plate in State I. either in red or in the official black, but we have been able to reconstruct it. ...the centres of the six screws which were substituted later and which partly constitute State II. There are, however, other features which have not, until now, been noticed. In the original state the borders were of great widthsome 16 m.m., and contained six further rivets of large size. Of these, four were placed diagonally, far beyond the four small corner-rivets, and the remaining two, centrally, in the top and bottom borders, with their centres about 14 m.m. from the nearest engraving. ...then have been affixed to a separate bed only slightly larger than the plate itself. A brief reference to our illustrations will shew that this must have been so. The point will be proved to be one of great philatelic importance. A few preliminary remarks may be offered. 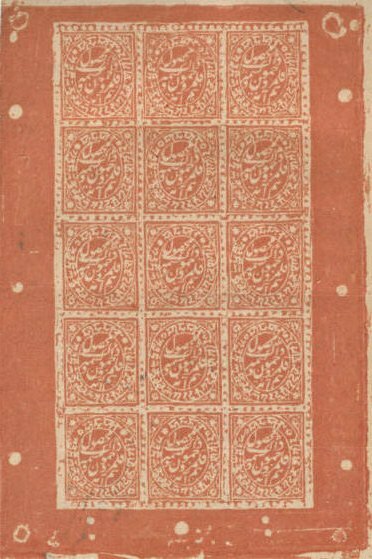 (1) The plate of the ⅛-Anna is absent from our list, since no simultaneous printing could have occurred, for no printing in black was ever issued, while during the red and orange printings the plate was not in existence. (2) No simultaneous printing was ever made from Plates in State I., reasons for which will appear later. (3) In the case of the ½-Anna, although only a small proportion of stamps could have been printed from it in its short-lived State II., and the great majority must have been from State III., yet in all positions illustrated, the plate has been in State II. The fact appears remarkable. We have examined some hundreds of the very common black sheets in State III., without finding, until 1931, a trace of marginal evidence of any other plate having been printed with it when in this condition. 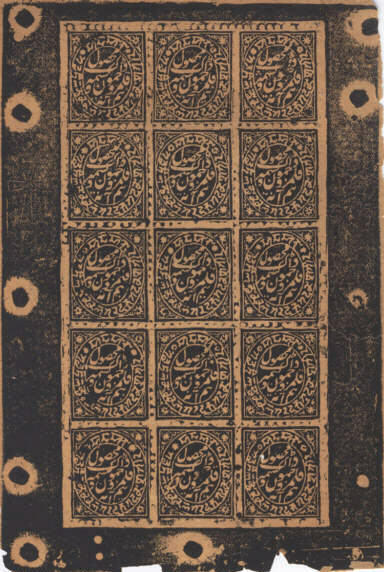 In that year we discovered a sheet of the ¼-Anna black on thin wove showing, at its right margin, a black printing from the ½-Anna Plate in State III. We know of no other example. 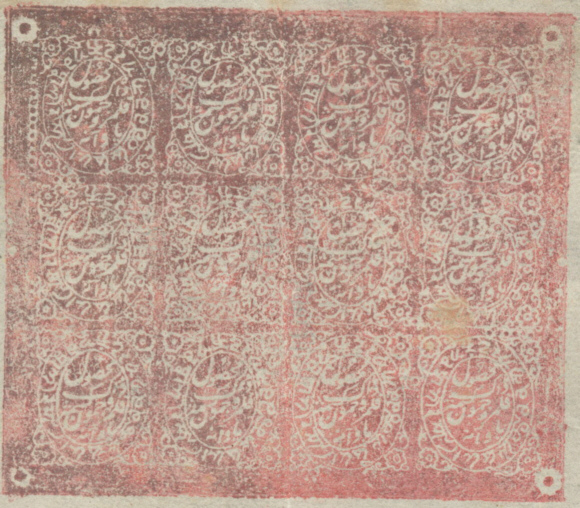 The rarity of such a printing from the ½-Anna Plate in its latest state in combination with a Plate of different denomination, is probably to be explained by the very great demand, during the concluding years, for the Official ½-Anna. (4) It must be noted that our remarks apply to impressions. Thus, “on the right” would mean the right of the impression, but the left of the plate in its printing position. The following table shews all the different positions (as yet known) occupied by the plates during simultaneous printing from two at a time. The first-named plate is, in all cases, to be understood as being viewed in an upright position. All the plates noted above were in State II.in other words, the ½-Anna in its intermediate, and the remainder in their latest, states. 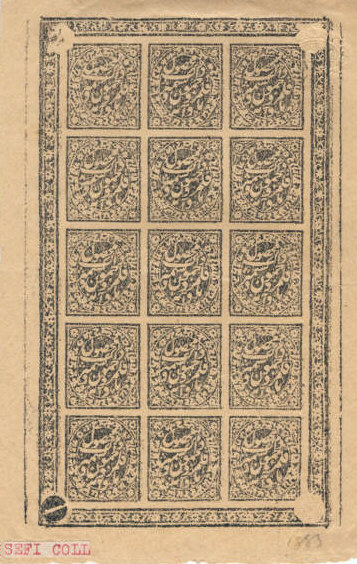 All papers were varieties of thin toned wove, the absence of the “pure white” quality apparently indicating that simultaneous printing had been discontinued by 1889. The relative positions in this printing are similar to those of No. 4, but in this case the ½-Anna Plate is in its third State as mentioned above. In the case of our illustrations Nos. 2, 3 and 4 it may be noticed that the plate-positions of each have been reconstructed. Each of these reconstructions are made from two sheets, neither of which shewed more than a porition of the margin of the ½-Anna Plate. They are exactly accurate and have only been made in order to shew one complete adjoining stamp of each denomination. In several instances two or more slightly different placings of the same combination occur, shewing that plates had been separated after use and again re-united for further printings. As many as five of such occurences have been found in a single combination. Figs. 1 and 2 shew one such variation, the level of the tops of the plates being, relatively, very different in the two cases. All combinations are known in either black, or red, and several in both; while No. 6 is known both in black, red and orange. Fig. 6 shews a large white ring in the border of the ½-Anna plate occupying the position of the small rivet opposite Type 15. No large rivet was ever added here, and the ring must have been caused by curvature of the plate at this point. Instances of such curvature have also been found at other points of the border during State II., proving that some more or less serious distortion of this particular plate occurred during its brief second statea fact to which further reference will be made in Chapter XII. Fig. 9 is the only example known to us of this combination. It was in the collection of the late Mr. Beckton, who kindly permitted us to illustrate it. Fig. 12 shews a very remarkable impression, in the official black, of part of the border of either of the 1-Anna or 2-Annas plate actually overprinted on that of the ½-Anna. 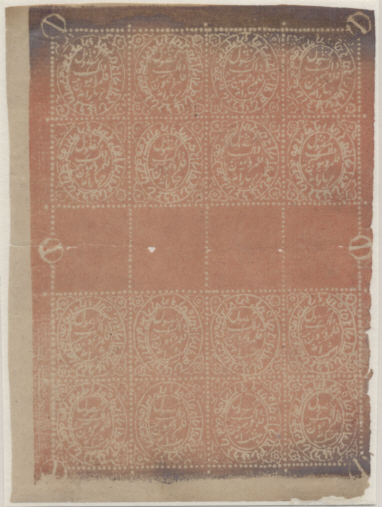 Such a combination could not, of course, have occurred during simultaneous printing from adjoining plates; these plate-impressions, of which several are known, must have been taken by transferring the sheet from one plate to the other. For reasons which cannot be entered into at this point, an explanation of this “over-printing” must be deferred until dealing with the official stamps in Chapter XII. ► Chapter VIII continued: Papers and Watermarks.